There were emotional scenes in east Belfast at the weekend as a 91-year-old widow, whose husband was murdered by the IRA, witnessed the unveiling of an Orange lodge banner in his memory. Newtownards Road area resident James McCurrie was shot dead along with Bobby Neill when IRA gunmen opened fire from the grounds of St Matthew’s chapel into the neighbouring Protestant district in June 1970. Although republicans often refer to the incident as having occurred during a “gun battle,” an investigation by the Historical Enquiries Team found that both men were innocent victims and not members of any paramilitary organisation. 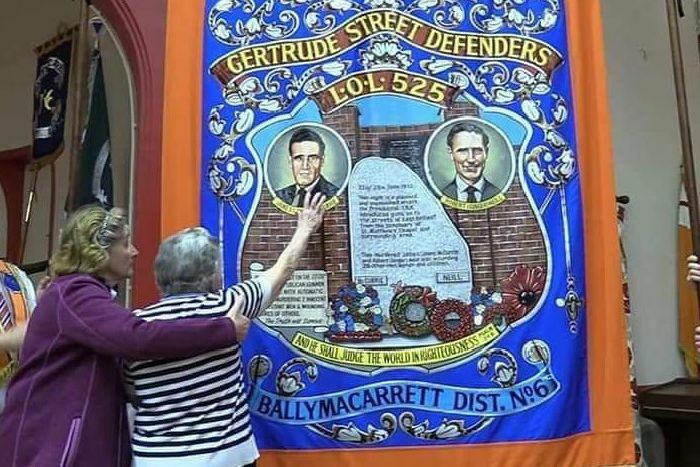 On Saturday evening, Mrs McCurrie and other family members were invited to Ballymacarrett Orange Hall where the local Gertrude Street Defenders lodge was dedicating a banner in memory of the two men. Mary McCurrie accompanied her mother to the dedication ceremony. Ms McCurrie said her mum was very emotional on the night. Ms McCurrie has also appealed for anyone involved in the shooting to “search their conscience” and go to the PSNI with information. “Everybody in the area knows who was there that night, but the general attitude of the police is that they can’t do anything unless there is new evidence,” she said. “The IRA commander that night has boasted in various Irish republican publications about what they call the ‘battle of St Matthew’s’. They have also told a lot of lies about it to try to justify what they did. A Catholic man found dead in the grounds of St Matthew’s around the same time, Henry McIlhone, is believed to have been accidentally shot by the IRA.